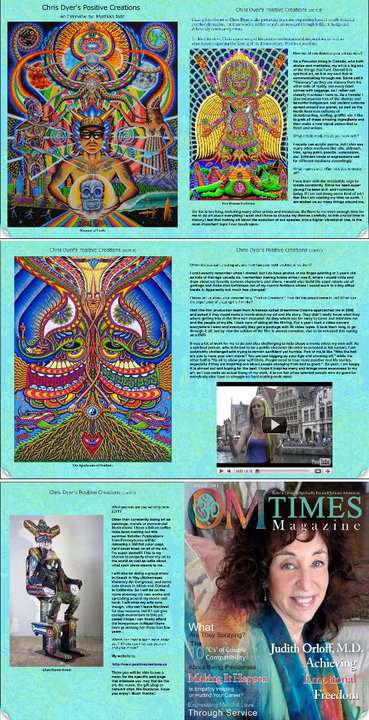 I am now the Cultural Creative Arts Editor for OM-Times Magazine! I love this green, conscious, metaphysical publication. It comes out twice per month and features a diverse array of articles, interviews, art, poems, and news that pertains to the metaphysical community. AND - each issue is free to the reader. For the March 1, 2011 interview, I interviewed Positive Creations artist Chris Dyer in my section, which begins on page 100. In the next issue, I will be interviewing Los Angeles based psychic, dancer, writer and performance artist Forest Nui Cobalt.